I think one of the most used words used by current college students to describe college is stressful and honestly, I am determined to define my college experience by other more positive adjectives. I am totally guilty of pinpointing college as stressful so do as I say not as I do! Along with time management college is such an important time to grasp and develop stress management. Maybe it will make us more enjoyable adults! Personally, I am a stressor. I think it comes with my perfectionist nature. Juggling an all too busy semester, blogging (which in all honesty feels like the most enjoyable full time commitment), and countless meetings time management and more importantly stress management have been my forte as of late. 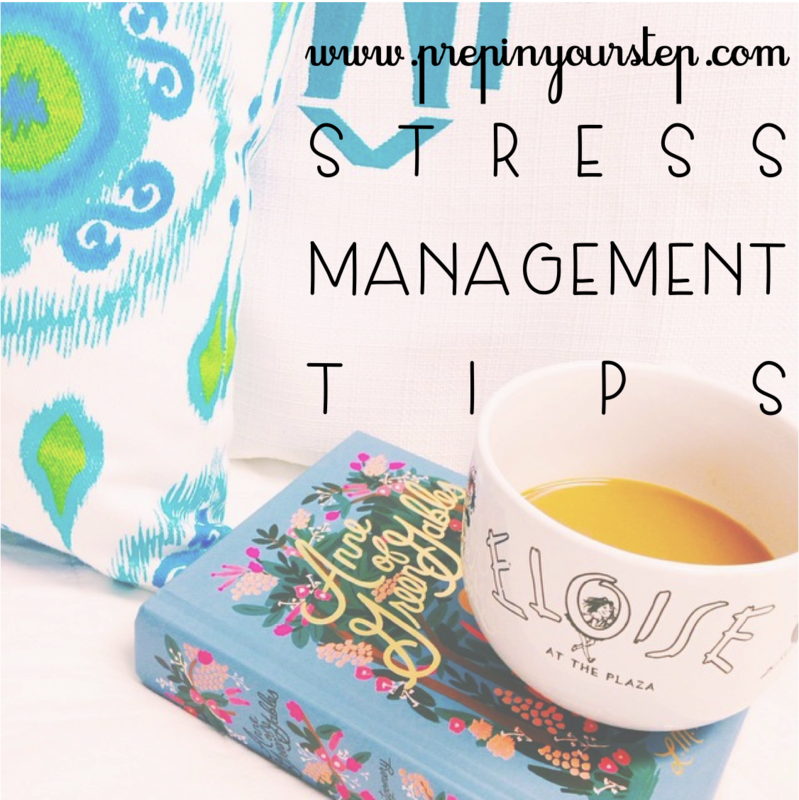 Check out some of the ways I have found valuable when stress seems to take over! Sit quietly with the lights off. No, I don't mean take a nap although that is also a great option. Sitting quietly with the lights off helps me to calm down a bit which is exactly what I need sometimes when I am stressed. So so so necessary when I stress seems to be controlling me! Do something for the sole purpose of your own enjoyment. Find my favorite ways to spend "me time" here! Release some of those endorphins! Some of my best runs have been stress runs! I think better after I workout and during the workout I am able to process some of my thoughts that feel like they are moving at 90 to nothing. My favorite workouts can be found here. Have a visual calendar that you can refer to. Sometimes looking at my calendar in my planner is utterly overwhelming but it makes me such a better planner! By seeing that the next week will be easier a bit of the stress I am feeling of the moment becomes so much more temporary. Crossing something off my to-do list is so exhilarating especially when it is a few miles long. Designate and complete a task that takes less than 15 minutes to give yourself some much needed motivation. Vent to your best friend. Nell sometimes has to serve as my own personal therapist. Just the other night we had our uniquest session yet in public at a restaurant and she was laughing and rationalizing right along with me. She knows exactly why I think an assignment and irrelevant and even if she thinks I am being ridiculous she will allow me to vent about it. Also, if you live anywhere near Greenville, South Carolina or will be in the area or know anyone who will on November 2nd you should definitely come hang out with me at my Sorority's Philanthropy Event! It is a 5k (you don't have to run it!) and is sure to be loads of fun with raffles, a silent auction, a live band, and an insanely cute shirt! I would love to see you there and help Prevent Child Abuse America and the Julie Valentine Center. Love the cause but aren't nearby? Feel free to donate here! This is a great post! Some of these things - if not all of them, lol - I need to adopt, haha! Having a visual calendar has helped out so much with my daily stress amount! Great post! Do you find that tea helps? My favorite (my mother's too) is orange spice by celestial, it seems to have a calming effect without the caffeine! Vent to your best friend is the best advice. Thanks for posting about the KD 5K! Sounds like a great event, I will try to make it! Great tips, will definitely be keeping these in mind (also that mug is awesome! ).